Actin Staining Techniques - Actin staining protocols, Actin stain, Actin probe, Acti-stain 488 phalloidin, Acti-stain 555 phalloidin, Acti-stain 535 phalloidin, Acti-stain 670 phalloidin, Actin stain, Actin -stain488. Actin stains and probes are used in determining the structure and function of the cytoskeleton in living and fixed cells. The actin cytoskeleton is a very dynamic and labile structure in the living cell, but it can be fixed by either cold methanol or paraformaldehyde prior to probing or staining for actin structures. In fixed cells, actin structures can be visualized by actin antibodies (1, see protocol below), fluorescent phalloidins (2, see protocol below), or electron microscopy (3). Antibodies recognize both monomer and polymer (filamentous or F-actin) actin and hence tend to have a high background compared to probes that bind only F-actin. Correctly designed fluorescent phalloidins only binding to the native quaternary structure of F-actin and therefore have a low background. To create the correct fixation conditions for phalloidin binding paraformaldehyde must be used as the fixative because it retains the quanternary protein structure which is necessary for high affinity. Methanol destroys the native conformation and hence is not suitable for actin staining with phalloidin. Fluorescent phalloidins vary greatly in their staining characteristics because of their structure, for example a positively or negatively charged fluorescent dye will create higher backgrounds by binding non-specifically through ionic interactions with other proteins. The Acti-stain series of dyes are non-ionic and therefore create very low backgrounds, they can even be used without washing steps after the staining procedure. Another aspect for low background fluorescence and increased brightness is the amount of quenching that is caused by the close proximity of the dye to phalloidin (4) or dye to actin (5). We have screened many combinations of dye and linker and created the optimal combinations which allows brightness to remain as high as the original fluorescent dye. The brightness of fluorescent probes is controlled by environmental factors, in addition to the quenching aspect mentioned above, there is also a rotational consideration, if the dye is allowed to move freely there is a reduction of emitted light, rather the energy is dissipated as heat. The rotational status of dyes judged by their quantum yield allows the development of brighter dyes. The brightness of fluorescent phalloidins is also affected by their affinity for F-actin. Unlabeled phalloidin has a Kd of approx. 36 nM, whereas fluorescent conjugates of phalloidin can vary from 50 nM to 20 µM (Ref. 4 and Figure 2 opposite for Acti-stain 488), the lower the Kd the higher the affinity and hence the better binding is achieved which results in a brighter stain. Acti-stain dyes have Kd's in the lowest range 50 to 100 nM which creates bright fluorescence signals (for more information click here). Fluorescent dyes can be photo-deactivated by intense microscope light sources. This affect can be reduced with anti-fade solutions such as DABCO (see BK005 kit below), and also by engineering the dye to remove ionizable protons. Many of the modern dyes, Acti-stain ones included, have replaced ionizable protons with fluorine which does not ionize as readily and therefore does not bleach as much as traditional dyes such as fluorescein (6). Fluorescent phalloidins have two characters which affect signal stability, these are photo-bleaching as described above and their affinity for F-actin. 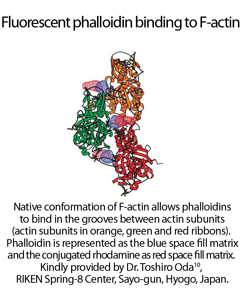 The latter aspect can be observed with low affinity conjugates such as coumarin phalloidin (4) which are released from F-actin during storage before microscopic observation. Yeast cells contain highly divergent actin proteins but these still bind to some fluorescent phalloidins such as Acti-stain 488 as shown adjacent. For the performance and chemical characteristics of the Acti-stain dyes click here. Rhodamine actin has been microinjected into CHO cells. The labeled actin rapidly incorporates into the cellular actin cytoskeleton and allows real time observation of actin dynamics. In living cells actin structures can be observed by incorporating fluorescently labeled actin, expressing GFP-actin, or a fluorescently labeled actin binding protein sub-domain. Fluorescent actin is the most accurate reporter of actin structures but it is sometimes difficult to load into cells which is accomplished by microinjection or a protein transfection reagent (see protocol below). Recently, cell-permeable and non-cytotoxic live cell imaging probes (SiR-Actin and SiR-Tubulin) were introduced in a landmark paper published in Nature Methods. 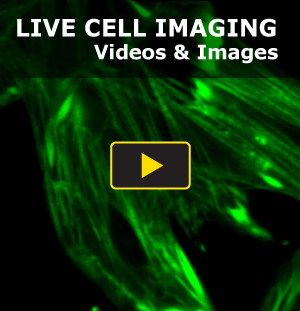 To learn more about these live cell imaging probes including protocols, videos, and images click here. GFP-actin DNA vectors are readily transfected into cells, however some cells e.g. primary cells, are recalcitrant to transfection technology but this will undoubtedly improve over time with the introduction of new vectors such as viral particles. GFP-actin is also known to interfere with normal cytoskeletal dynamics producing aberrations in nuclei number per cell and myosin processivity (7). F-actin binding protein tags are useful conjugates to probe F-actin in live cells (8,9) but they also need the bulky GFP reporter to produce a signal. 1. Fixing and staining tissue culture cells with fluorescent phalloidin (F-actin), Dapi (DNA) and an antibody. 2. Labeling F-actin in vitro for microscopic molecular studies. 3. 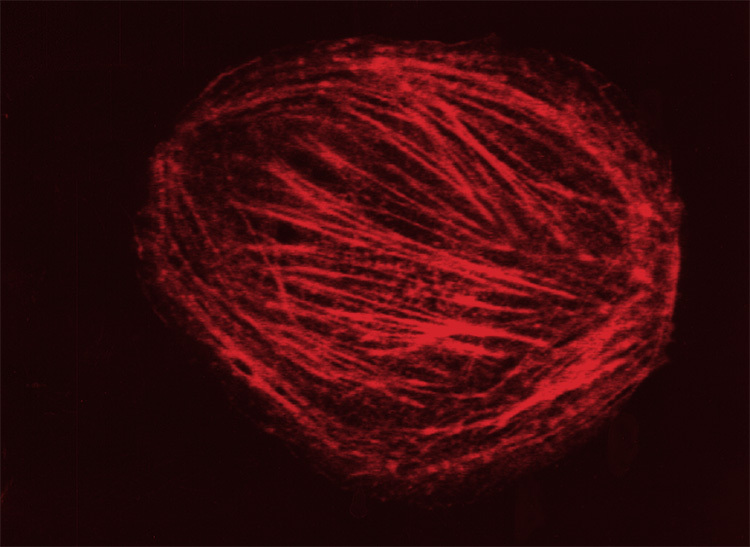 Loading live cells with fluorescent actin. 4. FIxing and staining tissue culture cells or slices grown in a 3D collagen matrix with fluorescent phalloidin. Protocol 1 - Fixing and staining tissue culture cells with fluorescent phalloidin (F-actin), Dapi (DNA) and an antibody. There are several methods that are used for fluorescent staining of actin filaments in tissue culture cells. The fixation procedure is critical for obtaining faithful representation of the F-actin distribution within the cell. The fixation method should be selected on the basis of the experimental requirements. Fixing tissue culture cells in paraformaldehyde or glutaraldehyde results in excellent actin filament staining and good lamellipodia preservation. 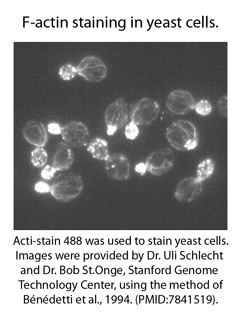 Acti-stain™ 488 Phalloidin (Cat. # PHDG1). Semi-confluent Swiss 3T3 cells grown on 25 x 25 mm glass coverslips grown in DMEM plus 10% fetal bovine serum and 1% Fungizone. 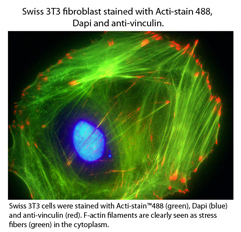 Either obtain the F-actin staining kit from Cytoskeleton, Inc. (Cat. # BK005) or prepare Reagents 4 thru 8 below. Phosphate-buffered saline (PBS, 50 mM potassium phosphate pH 7.4, 50 mM NaCl). Fixative solution (3.7% paraformaldehyde in PBS, pH to 7.0 is necessary). Permeabilization buffer (0.5 % Triton X-100 in PBS). Antifade mounting medium (Fluka BioChemika, Cat. # 10981). 100 nM DAPI (4' 6-diamidino-2-phenylindole) in PBS. Glass microscope slide (25 x 75 x 1 mm). Coverslip sealing solution (clear nail polish). Fluorescent microscope with FITC excitation filter at 450-480 +/- 20 nm and emission filter at 535 +/- 20 nm for Acti-stain™ 488, and an excitation filter at 355 +/- 20 nm and emission filter at 440 +/- 20 nm for DAPI. Grow tissue culture cells on glass coverslips until semi-confluent. Prepare 100 nM working stock of Acti-stain™ 488 phalloidin by diluting 3.5 μl of 14 μM labeled stock phalloidin into 500 μl of PBS. Keep at room temperature in the dark. Remove culture media and gently wash the cells once with PBS at room temperature (RT). Move the coverslip to a piece of parafilm in a humid chamber and add 200 µl of fixative solution to each coverslip for 10 min at RT. Wash the cells once with PBS at RT for 30 s.
Permeabilize the cells by pipetting 200 µl of permeabilization buffer on to the coverslip and incubating for 5 min at RT. Wash the cells twice with PBS at RT for 30 s.
Incubate with 1 mg/ml BSA in PBS for 1h at RT. Note: Italicized sections can be removed if antibody staining is not required. Wash once with PBS at RT for 30 s.
Pipette 200 µl of primary antibody solution and incubate at RT for 1h (or 2h if dense cellular location such as nucleus). Wash three times with PBST at RT for 5 min each wash.
Wash three times with PBS at RT for 5 min each wash.
Pipette 200 μl of 100 nM Acti-stain™ 488 phalloidin plus 100 nM Dapi solution in PBS. Incubate at RT in the dark for 30 min. Wash the coverslip three times in PBS for for 30 s each wash. Remove liquid from the coverslip by touching the corner on a paper towel and invert on a drop of antifade mounting media on a glass slide. Leave for 20 min to dry and seal each side with nail polish. Either view immediately of Store the slides in the dark at 4°C for upto 24 h.
Typical F-actin staining results are shown in Figure 3 (above). Protocol 2 - Labeling F-actin in vitro for microscopic molecular studies. Stabilized fluorescent actin filaments are an excellent substrate for in vitro actin motility assays used in the study of myosin motor proteins (2). 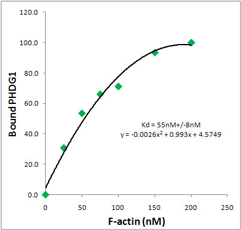 Acti-stain™ 488 phalloidin binding has no effect on actin activation of myosin ATPase in vitro. Actin protein (250 μg, Cat. # AKL99-A). General Actin Buffer (5 mM Tris-HCl pH 8.0, 0.2 mM CaCl2; Cat. # BSA01). 10x Polymerization Buffer (500 mM KCl, 20 mM MgCl2, 10 mM ATP; Cat. # BSA02). 1) Fluorescent microscope with excitation filter at 450-480 +/- 20 nm and emission filter at 535 +/- 20nm (FITC filter block). Resuspend rabbit muscle actin (Cat. # AKL99-A) to 1 mg/ml with 250 μl of General Actin Buffer supplemented with 0.2 mM ATP and 1.0 mM DTT. Mix well and leave on ice for 1 h.
Polymerize the actin with 1/10th the volume of Polymerization Buffer for 1 h at room temperature. Dilute the polymerized actin filaments 100 fold in 1x Polymerization Buffer containing 70 nM Acti-stain™ 488 phalloidin (2.5 μl of 14 μM stock plus 500 ul of polymerization buffer). Spot 1 μl of the labeled actin into a drop of anti-fade mounting media on a microscope slide. Place a coverslip over the drop and remove excess liquid with a tissue. Examine the fluorescent filaments by microscopy. Actin filaments will have an average length of 2-10 μm and are stable at 4°C in the dark for 1 week. Protocol 3 - Microinjection of rhodamine muscle actin into tissue culture cells. Rhodamine muscle actin (Cat. # AR05). Tissue culture cells seeded on glass coverslips. Resuspend rhodamine muscle actin to 2 mg/ml with General Actin Buffer supplemented with 0.2 mM ATP and 1 mM DTT. Leave on ice for 1 h to depolymerize actin oligomers. Note: If calcium ions affect the cells, rhodamine muscle actin can be resuspended in pure water. Centrifuge the muscle actin solution at 14,000 x g at4°C for 10 min. (or better 100,000 x g at 4°C for 10 min). Remove the top 90% of the supernatant to a new tube and load the microinjection needle by capillary action. Microinject rhodamine muscle actin into cells maintaining positive pressure in the needle to prevent blockage. Note: salt in the tissue culture media and in the cell cytoplasm can result in actin polymerization within the needle. View cells in a temperature controlled microscope stage using low light and a CCD camera. Cells or tissue slices are grown in 3D collagen matrices to more accurately replicate the in vivo cellular milieu that cells function in to study how cell morphology and function respond to the extracellular environment confining the cell. To faithfully capture the integrity and structure of the F-actin cytoskeleton (and any changes it undergoes) with a fluorescent phalloidin stain, proper fixation and handling of the cells/slices is necessary. For fixation of cells for phalloidin staining, methanol must be avoided and instead, paraformaldehyde or glutaraldehyde should be used as they provide excellent actin filament staining and good lamellipodia preservation. Fluorescent microscope with FITC excitation filter at 450-480 +/- 20 nm and emission filter at 535 +/- 20 nm for Acti-stain™ 488. For Acti-stain red fluorophores, the excitation filter is 535 +/- 20 nm and emission filter at 585 +/- 20 nm for Acti-stain 535 and 555. For Acti-stain 670, the excitation filter is at 630 +/- 20 nm and the emission filter is at 680 +/- 20 nm. Reconstitute phalloidin according to manufacturer’s directions. Dilute to working concentration as directed in PBS. Keep working stock of fluorescent phalloidin in the dark at room temperature. Fix cells in the collagen gels with 3.7% (v/v) paraformaldehyde 10 min at room temperature. Rinse 3 times in PBS. Permeabilize cells with 0.1 -0.5% (v/v) Triton X-100 for 10 min at room temperature. Cut collagen gels into ~1 mm3 samples. Stain with 0.165 μM Acti-stain phalloidin for 30 min in the dark at room temperature. Note: This concentration may need to be empirically determined. Cell nuclei can be stained with 100 nM DAPI in PBS in concert with phalloidin if desired. Wash 3 times with PBS. Place stained samples on glass slides and gently press with a glass coverslip using a drop of anti-fade mounting medium to prevent photo-bleaching. If possible, seal each side of coverslip with nail polish. Either view immediately or store the slides in the dark at 4°C for up to 24 hrs. Visualize the cells in stained samples with an appropriate fluorescence microscope set-up. For example, a confocal fluorescent microscope with a 63X oil-immersion lenses at the appropriate filter excitation and emission settings. For analysis of staining in 3D gels, collection of 5-10 representative maximal projection z-stacks from each sample are useful to determine the average brightness of cells within each image. 1. Lazarides E, and Weber K. 1974. Actin antibody: The specific visualization of actin filaments in non-muscle cells. PNAS USA 71, 2268-2272. 2. Wulf F, Deboben A, Bautz FA, Fualstich H, and Wieland TH. 1979. Fluorescent phallotoxin, a tool for the visualization of cellular actin. PNAS USA71, 4498-4502. 3. Weber K, Rathke PC, & Osborn M. (1978). Cytoplasmic microtubular images in glutaraldehyde-fixed tissue culture cells by electron microscopy and by immunofluorescence microscopy. PNAS USA75, 1820-1824. 4. Small JV, Zobeley S, Rinnerthaler G. and Faulstich H. 1988. Coumarin-phalloidin: a new actin probe permitting triple immunofluorescence microscopy of the cytoskeleton. Journal of cell Science, 89, 21-24. 5. Lefevre C, Kang HC, Haugland RP, Malekzadeh N, Arttamangkui S. and Haugland R. 1996. Texas Red-X and Rhodamine Red-X, new derivatives of sulforhodamine 101 and Lissamine rhodamine B with improved labeling and fluorescent properties. Bioconjugate Chem., 7, 482-489. 6. Sun W-C, Gee KR, Klaubert GH, and Haughland R. (1997). Synthesis of fluorinated fluoresceins. J. Org. Chem. 62, 6469-6475. 7. Westphal. M, Jungbluth A, Heidecker M, Mühlbauer B, Heizer C, Schwartz J-M, Marriott G, and Gerisch G. 1997. Microfilament dynamics during cell movement and chemotaxis monitored using a GFP–actin fusion protein. Current Biology 1997, 7,176–183. 8. Riedl J, Crevenna AH, Kessenbrock K, Haochen Yu J, Neukirchen D, Bista M, Bradke F, Jenne D, Holak TA, Werb Z, Sixt M. and Wedlich-Soldner R. 2008. Lifeact: a versatile marker to visualize F-actin. Nature Methods, 5(7), 605-611. 9. Pang KM, Lee E, and Knecht D. (1998). Use of a fusion protein between GFP and an actin-binding domain to visualize transient filamentous-actins tructures. Current Biology, 8, 405-408. 10) Oda T, Namba K, and Maeda Y. (2005). Position and Orientation of Phalloidin in F-Actin Determined by X-Ray Fiber Diffraction Analysis. Biophys. J, 88, 2727–2736.